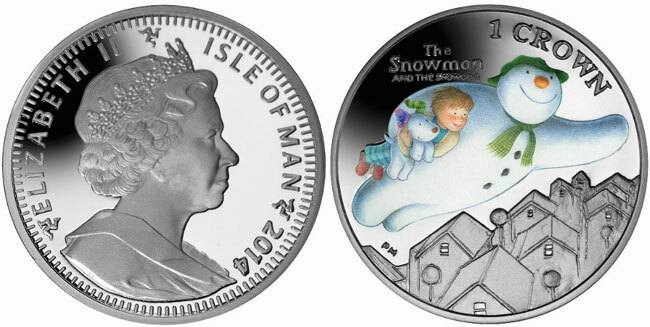 The Treasury of the Isle of Man Government have issued new coins which celebrate both the upcoming Christmas holiday as well as one of the season’s most endearing films, The Snowman. The film story is told through pictures, action and music. It is wordless like the book, except for the song “Walking in the Air”. In addition to the orchestral score, performed in the film by the Sinfonia of London, the music and lyrics of the song were performed by a St Paul’s Cathedral choirboy Peter Auty. The Snowman, the 26 minute animated film was based on a book published in 1978 written by Raymond Briggs. The film was first telecast on the 26th December 1982 in the United Kingdom and was an immediate success. The film was nominated for the 1982 Academy Award for Animated Short Film. A sequel entitled The Snowdog was subsequently released in 2012. The original story beautifully captures the magic and excitement of childhood as well as being a heart-warming story about love, loss and friendship. When a young boy, Billy, moves house, he discovers a secret box hidden under the floorboards. In it are a hat, scarf, some lumps of coal and a shriveled tangerine – a snowman-making kit! Later that day it snows and Billy builds a Snowman and, with a little spare snow, a Snowdog. That night, at the stroke of midnight, The Snowman and The Snowdog magically come to life. The boy awakes and joins them on an amazing adventure. The two coins, a 50 pence and crown example are produced by the Pobjoy Mint, UK on behalf of the Isle of Man Treasury and include two different color scenes from the film. 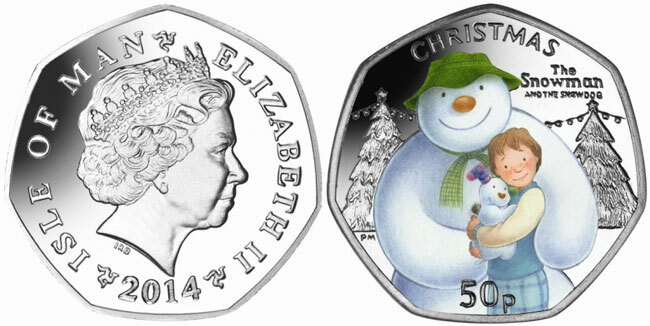 The 50 Pence coin shows the three main characters as if posing for a photograph with some Christmas trees in the background. The obverse of the 50 pence coin includes the current effigy of HM Queen Elizabeth II designed by Ian Rank-Broadley and in use on most UK & commonwealth coinage since 1998. The new Crown also features these loveable characters and shows The Snowman, The Snowdog and Billy flying high above the rooftops. The crown’s obverse portrait includes a head & shoulders image of the Queen also designed by Mr. Rank-Broadley. Each precious metal coin has been carefully struck four times and features a frosted high relief sculpting against a mirror brilliant background. An accompanying Christmas card with corresponding images of both coins is also available for gift-giving. For more information on this and other coins offered by the Treasury of the Isle of Man Government, please visit the website of the Pobjoy Mint at: http://www.pobjoy.com/ukworld/section.php/815/0 Information offered in English, international orders dispatched.